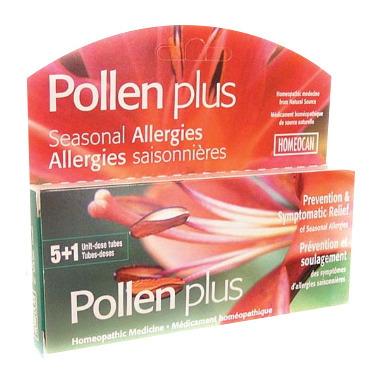 Homeocan Pollen Plus is Homeopathic medicine for the prevention and symptomatic relief from seasonal allergies. SUGGESTED USE: Allow the content of one tube to dissolve under the tongue once a week for 6 weeks. For prevention: start treatment one month before allergy season and continue throughout the season to boost the immune system. WARNINGS: Consult a healthcare practitioner before use if you are pregnant or nursing. Consult a healthcare practitioner and discontinue use if symptoms persist or worsen. Do not exceed recommended dosage. I used to have major allergies in the spring, especially on Vancouver Island. Was so bad I was thinking I couldn't live there any longer. It made me feel always tired and extremely aggravated and irritated. This Pollen Plus, recommended by a health food store in Courtenay made my life so much better and literally solved my problems. Taken a tube every 6-7 days in the spring. I'm totally surprised and very disappointed that most health food store in the interior and Edmonton don't carry the product. Fortunately I can request and most of them will get it within a week for me. This is great pre-season product to build immunity before allergy season. Easy to take and very effective. This is a great alternative to allergy medication. It's a natural product that you take only once a week. It worked very well for my allergies, I had great relief the following day. And you only need to take it once a week, so it's cheaper than using over the counter brands. I even like the taste!